The peace sign has long been an important image and symbol for me, not just because I am pro-harmony and anti-war, but because it is the graphic icon that taught me the power of an easily recognized and reproduced symbol. As a rebellious teen in the '80s, I embraced the peace sign as an emblem of counterculture favored by skateboarders who listened to punk and reggae. Looking back, it is remarkable that the peace sign crossed over to punks who said "never trust a hippie!" Even the reject-everything punks were susceptible to the graphic strength and allure of the peace sign. I was one of those punks and not only did the peace sign pique my interest visually, but it also led me to investigate anti-war ideas and movements. I eventually ended up putting a "STOP THE ARMS RACE NOT THE HUMAN RACE" bumper sticker on the family station wagon, most likely as a domino effect catalyzed by a curiosity about the peace sign. Eventually, I had a professor, a hippie I trusted, who taught me about the Vietnam War, the anti-nuclear proliferation movement, and the protest movement against the Vietnam War in the late '60s and early '70s. My teacher was cool enough to mention the role symbols like the peace sign, the dove and flowers in the ends of guns played in the activist movement, and how especially the peace sign became pervasively woven into many areas of pop culture. In many ways, I think that the peace sign as an easily understood ubiquitous symbol of opposition to the Vietnam War played a major role in diminishing the public support for the war. When I began to create images protesting the war in Iraq, I immediately thought of the success of the peace sign during the Vietnam era, and I began incorporating the symbol into many pieces of my work. Not only do I think the peace sign is strong visually, but it also brings to mind an activist movement whose energy and tactics created a widespread shift in the culture. In the post 9/11 climate of fear and the rush to war with Iraq, I saw many parallels to the Vietnam era which inspired me to use the peace sign as a pacifist symbol, but also to remind people just how analogous the mistakes of Vietnam were to the mistakes in Iraq. Looking at Jim Marshall's images, I'm struck by how acutely he picked up on the rise of the Peace Sign as a counterculture, and later a dominant-culture, symbol. Marshall has an image from 1963 (we can tell from the date on an ad poster) with a peace sign drawn on a subway wall. 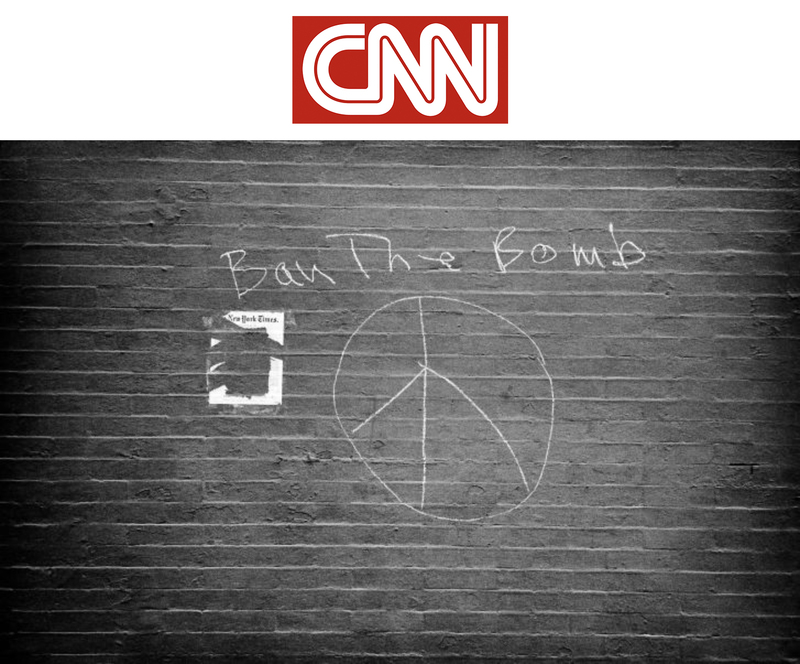 Many of Marshall's photos are of graffiti of the peace sign with "ban the bomb" written next to it. Marshall was obviously attuned to the peace sign as part of the anti-nuclear proliferation movement long before it reached a critical mass as a symbol of the anti-Vietnam War movement. These photos demonstrate Marshall's keen eye for imagery signifying the counterculture and his awareness of the viral and do-it-yourself nature of the graffitied and handmade peace signs showing up on walls, guitar cases, and clothing. What I find most exciting and unusual about these peace photographs is that symbols and slogans of peace dominated by the peace sign are the subjects of these portraits. These portraits showcase an idea rather than pictures of famous musicians, scenesters or politicians, and the artful nature of the images indicate that Marshall saw the role of the peace sign as a crucial character or protagonist within the culture. I'm most moved by the mystery and anonymity of the images that only show the peace sign and maybe accompanying text as the visible residue of an act of defiance. Small rebellious acts like a piece of graffiti pushing back against injustice, encourage me to take action and remind me that regardless of how alone I may feel, there are kindred spirits out there. I think Jim Marshall saw the value in documenting the evidence that something's happening out there!